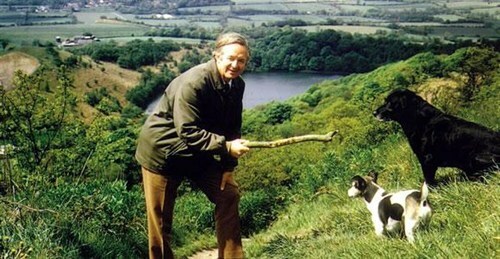 The stories of veterinarean James Herriot, who wrote “All Creatures Great and Small” and died 20 years ago today aged 79, remain immensely popular and they attract many tourists to Yorkshire but they did not make him a fortune. That was in 1979 when I interviewed him for TV Guide Canada. His real name was James Alfred Wight and he told me that his inspiration came one day when he finished his pint of McEwan’s Export ale and strode from the Three Tuns punlic house into the quiet Yorkshire evening. Once more, the villagers of Thirsk in the North Riding had supped their bitter entranced with his yarns about life as a country veterinarean in the 1930s. Writing did not come easy: “The hardest thing was to realise that I couldn’t write. Aye, that was a nasty blow. When I’d written it down, I realised it was just terrible, you see. It was rather like a child’s school essay. Great, long balanced sentences that nobody in his right senses would ever think of paying money to read. The eventual result was a novel titled “If Only They Could Talk”, a charmingly rustic and amusing account of Wight’s own introduction into the quaint and curious ways of farmers in the rolling hills of Yorkshire’s Pennine country before World War II with a combustible older partner he calls in his books Siegfried Farnon. It led to another book, “It Shouldn’t Happen to a Vet” and they both sold comfortably. But then an American publisher picked them up and packaged them as one under the inspired title of “All Creatures Great and Small”, and remarkable things began to happen remarkably fast. Herriot said, “The books were more or less limping along here and then they found out I was a bestseller in the United States and they began to take a bit of notice at home.” More books followed, packaged in the States as “All Things Bright and Beautiful” and “All Things Wise and Wonderful”. Anthony Hopkins starred as Siegfried Farnon in a feature film, “All Things Great and Small” in 1975 with Simon Ward as Herriot and “It Shouldn’t Happen to a Vet” (1977) starred John Alderton as Herriot with Colin Blakely as Siegfried. 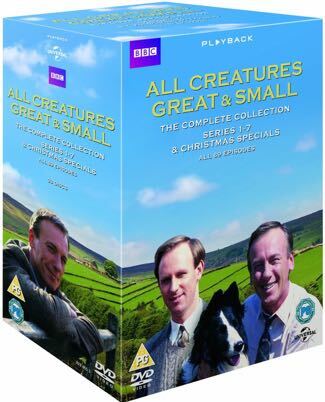 In 1977, BBC-TV launched a 13-part series of “All Creatures Great and Small” with Robert Hardy as Siegfried and Christopher Timothy as Herriot. It reached an audience of 19 million every Sunday night and ran on and off until 1990 and is still available on DVD. 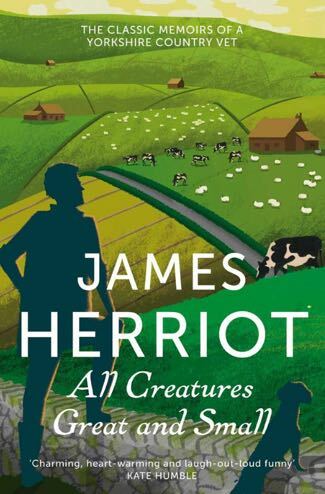 This entry was posted in Books, Film, Interviews, Memory Lane, Recalling ..., Television and tagged 'All Creatures Great and Small', James Herriot. Bookmark the permalink.